There was lots of space! With room to spread out. The beds are comfy. Arlene S.
Quiet, clean, spacious. The large cutting table was great! Julie V.
There are three separate rooms for sleeping on the second floor. Two rooms have three twin beds and the third room has four twin beds. Linens and towels are provided. Two bathrooms with showers are found on the first floor and one bath with shower is on the second floor. Each bath has personal towel hooks. Bath towels are provided. You can bring your own food, we can help you arrange catering, or you can eat out at nearby restaurants. Grocery stores and restaurants are available within 10 miles. A list of nearby services is provided upon your arrival. The kitchen is fully equipped with oven, stove, microwave, toaster, coffee maker, crock pot, serving utensils, dishes, glassware, and silverware. One refrigerator is in the kitchen and a second small fridge and microwave are available in the large, upstairs craft room. A Keurig single cup coffee brewer and an assortment of complimentary K-Cups are available for our guests. This information is included on page 2 of the Reservation Form. If you are concerned about bad weather or emergency situations that could come up and restrict you from attending your retreat, consider purchasing travel insurance. This can be done on a person-by-person basis. I ran a sample quote for a 50 year old attending a 3-day retreat ($100), with cancellation and interruption coverage among other benefits, the premium was $30. Rates will vary depending on coverage, age, length of retreat, etc. Retreat insurance needs to be purchased very soon after booking your retreat. Stefanie is our massage therapist and gets wonderful reviews from all of our retreaters. She requires a two-hour minimum and will schedule as many massages as you like. There is a place on the Reservation Form to request massages if this is of interest to you. Bring along a pair of indoor shoes or slippers. Your favorite music can be played from your I-Pod, iPad, phone, or CD's on the sound system. We have some movies available to play on the big screen but if you have special movies you'd like to watch, bring them along. Wireless internet is available throughout the Red Barn and can be used for digital scrapbooking and to stream movies on your personal computer. The first floor kitchen/meeting room has a 15 x 25 work area. The large craft room on the second floor measures 40x40 so you have plenty of room to spread out and work. Ample natural lighting is found in both rooms. There are 20 - 3' x 5' work tables and 14 comfortable task chairs on rollers. 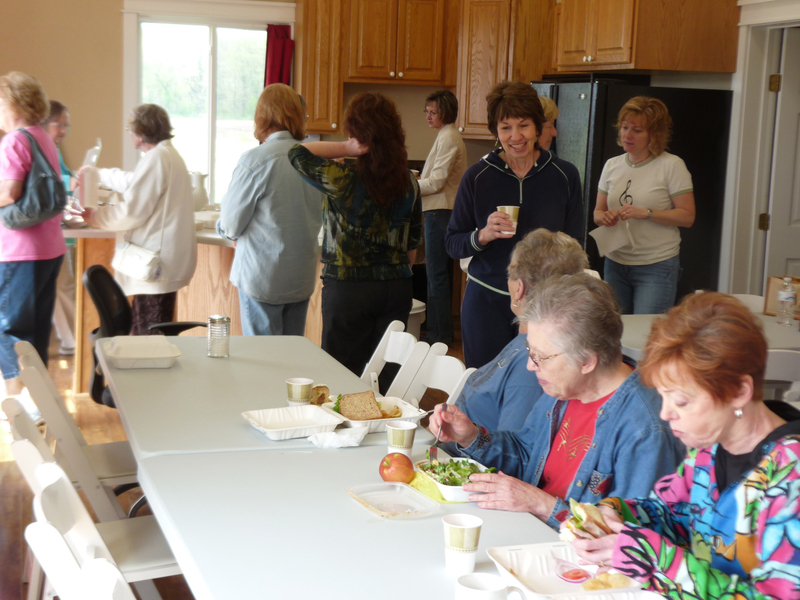 White, wooden folding chairs are also available for use while eating and for other large group retreats. Individual task lighting is found at each table when the natural daylight wanes. If you have your own lighting that you prefer, please feel free to bring it along. Both work rooms have multiple outlets with extension cords and surge strips provided. Both rooms have sufficient wiring to handle multiple sewing machines and irons. Four Cricut cartridges are available for your use. Cartridges: Cuttin' Up, Printing 101, Going Places, George and Basic Shapes. A large cutting table is also available. One large top ironing board, one iron, and a cutting table are provided. To complete your quilt during your time at Red Barn Retreats, you may choose to work with our professional, experienced quilter who will come to Red Barn Retreats, pick up your quilt, and quilt it during your retreat! Please contact us well in advance of your retreat if this interests you so we can make arrangements for this service. All linens and towels are provided. Pillows are down-filled. Stripping the beds after your last night is not required, but would be greatly appreciated. We understand that not everyone manages stairs as easily as the next person. With that in mind, help is available when it comes to carrying your items upstairs. Unloading at the front door makes unloading food quick and easy. Inside stairs are found just inside the front door and outside stairs leading up to the deck and banquet room can be used anytime, weather permitting. Contacting Marty@RedBarnRetreats.com ahead of time will ensure that he is available to help you unload when you check-in. You can also indicate your request for help unloading on the Reservation Form. Your privacy is important to us. Our home is 300 feet from Red Barn Retreats. We are available to assist you if needs arise, but we will not interrupt you during your retreat time. We may stop in once during the weekend to empty the trash and to see that everything is okay. This is your retreat time and we will respect your privacy. We ask that you leave your pets at home when retreating or visiting Red Barn Retreats. ...a place of peace and joy!